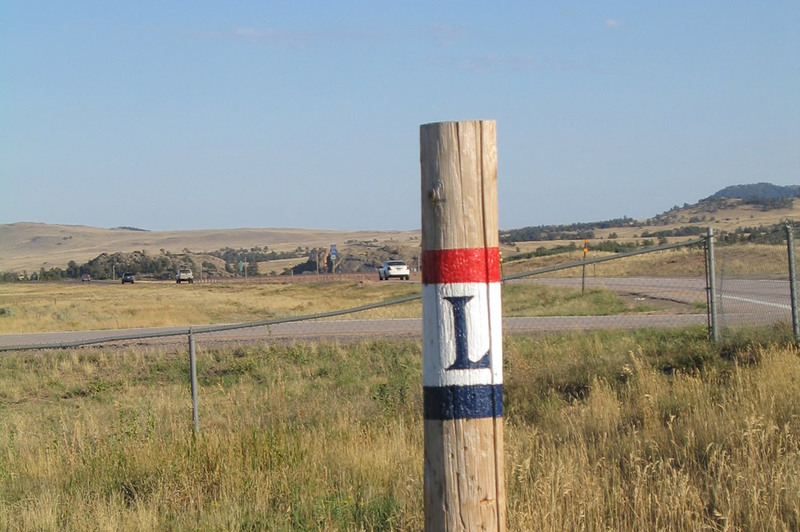 A replica historic Lincoln Highway marker is posted at the Tree Rock display in the median of Interstate 80 and U.S. 30 near Milepost 333. This page showcases some unique Lincoln Highway-related sights along the historic route, generally found along the Interstate 80 and U.S. 30 corridors. Photo taken 09/06/05. 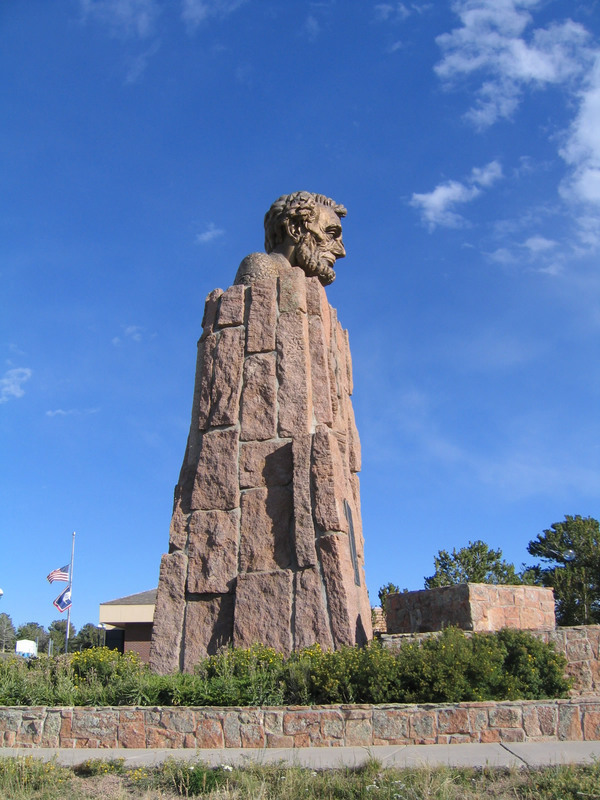 The Lincoln Highway is a transcontinental route that crosses 12 states on its journey from coast to coast. The highway predates both the Interstate Highway System (1956) and U.S. Numbered Highway System (1926), extending from New York City in the east to San Francisco in the west. 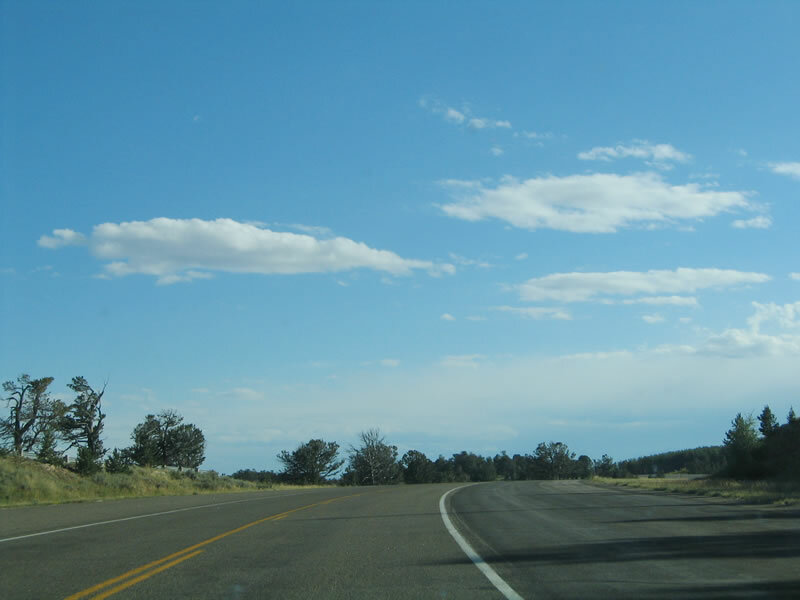 Most of the route is followed by either an Interstate or U.S. Highway, but there are some sections (notably in Nevada and Utah) that are all but abandoned and are not part of today's modern highway system. 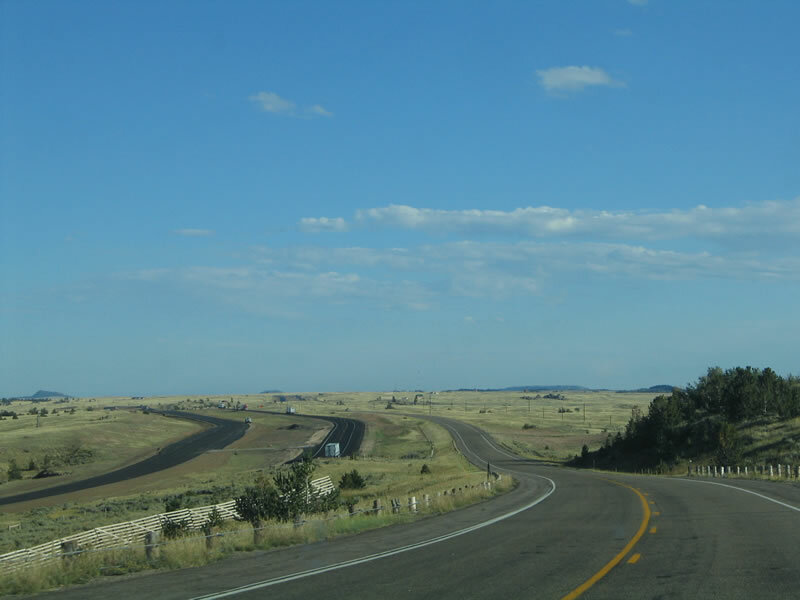 In Wyoming, the Lincoln Highway follows Interstate 80 and U.S. 30 across the southern tier of the state. 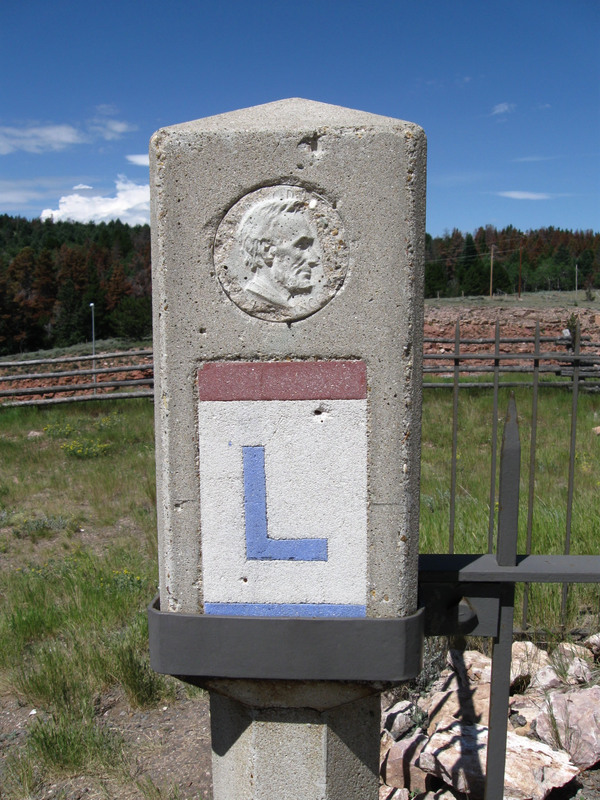 The Lincoln Highway is one of many named roads and trails that predated the U.S. Highway numbered system. Envisioned as a coast-to-coast roadway from San Francisco to New York, the "Father Road" (as opposed to U.S. 66, the famed "Mother Road") follows an alignment through 12 states, starting at Times Square in New York City and ending at Lincoln Park in San Francisco. It is not the most direct route between those cities -- Interstate 80 offers the most direct route today -- but the highway was one of the first transcontinental routes to cross the country. A group of motorists who were enthusiastic about such a transcontinental highway decided to form the Lincoln Highway Association to advance its proposed route in 1912. They were led by industrialist Carl Fisher, and Henry Bourne Joy (of Packard) joined Fisher in the quest to finance and build this transcontinental highway. While Fisher originally called his transcontinental route the "Coast-to-Coast Rock Highway," it was Joy who named it after President Abraham Lincoln, who was president during the Civil War. Through a fund raising campaign of fellow industrialists and auto makers, the Lincoln Highway Association (LHA) began the long and sometimes arduous process of marking the road and lobbying governments for their proposed new road. 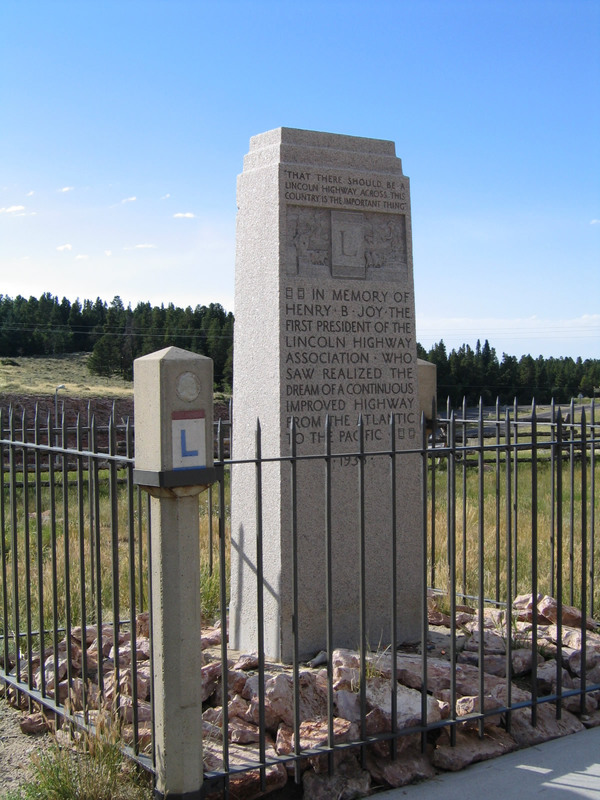 By 1913, the Lincoln Highway was an official route promoted by the LHA. In 1915, the first Lincoln Highway Association route guide was published, and it listed the cities and towns along the route. The route generally followed U.S. 1 from New York City southwest to Camden, New Jersey, then turned west along U.S. 30 from Camden west through Pennsylvania, Ohio, Indiana, Illinois, Iowa, Nebraska, and Wyoming to Echo Junction, Utah. 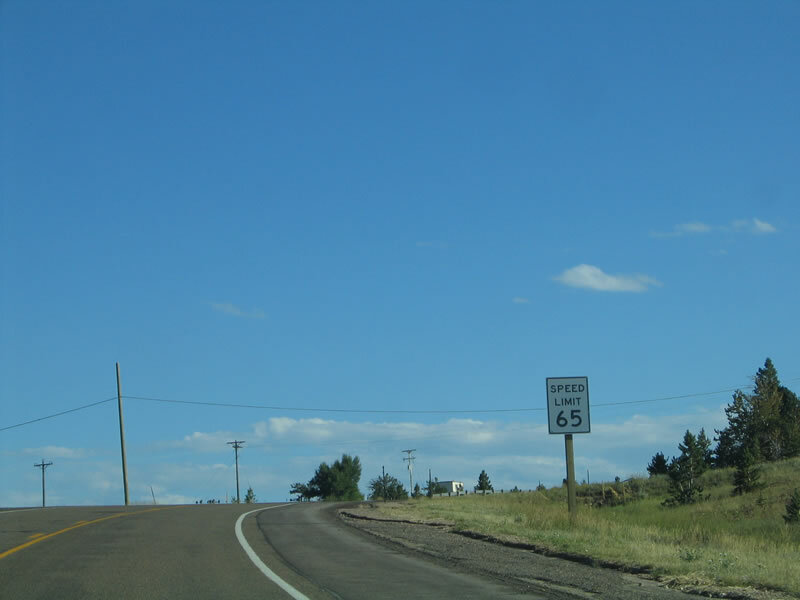 At Echo Junction, the Lincoln Highway turned southwest via former U.S. 530 to connect to U.S. 40. The highway continued west generally along U.S. 40 through Salt Lake City, then turned southwest via Fish Springs to Ely, Nevada (later generations of the road would move the Lincoln Highway to today's U.S. 40 and U.S. 93 Alternate via Wendover). From Ely west to San Francisco, the highway followed U.S. 50 (and former U.S. 48 between Stockton and Hayward in California). 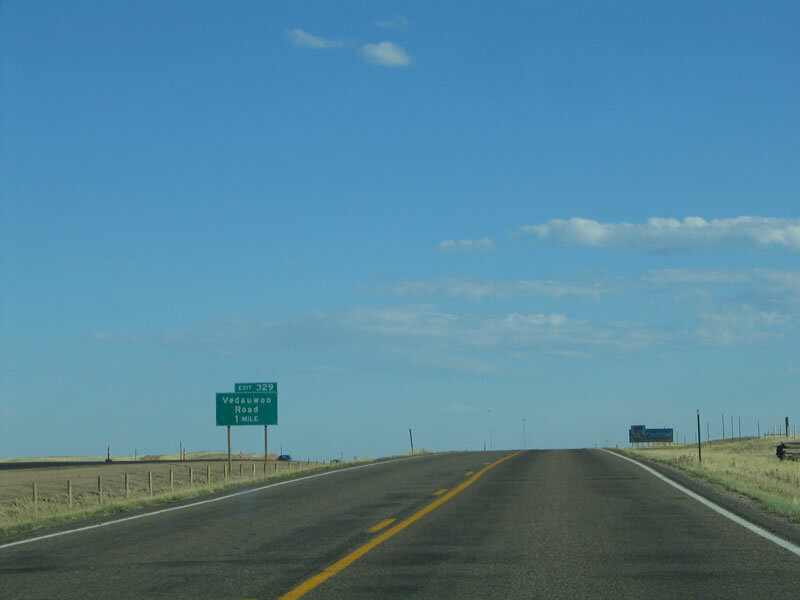 A special alternate route, called the Colorado Loop, followed U.S. 138, U.S. 6, U.S. 287, and U.S. 87 from Big Springs, Nebraska, to Cheyenne, Wyoming, via Denver. Through the 1910s and early 1920s, the Lincoln Highway gained in popularity as a travel route, even though there were issues with the route in western Utah and eastern Nevada. With the coming of the U.S. numbered highway system, the Lincoln Highway became lost among the various numerical designations that were specifically set to ensure that no named highway or trail was granted a single continuous highway number. By 1927, the Lincoln Highway Association had disbanded, and it was up to the states to improve their individual sections of the Lincoln Highway as part of their state highway networks. However, interest in this old road never waned, and the Lincoln Highway Association was restarted in 1992. Its mission is to "identify, preserve, interpret and improve access to the Lincoln Highway and its associated sites; pursue the appropriate measures to prevent further deterioration, destruction or alteration of the remaining sections of the Lincoln Highway; publicize and seek public awareness of its goals and activities for preserving, promoting and developing the Lincoln Highway; facilitate research about the Lincoln Highway, and publish a magazine for articles and news of activity relevant to the LHA; and work with local communities and businesses to promote the Lincoln Highway as a tourism destination." Greetings from the Lincoln Highway (Brian Butko) - this is also an excellent book, Greetings from the Lincoln Highway (2005). Look for Mr. Butko's book on Amazon.com and at your favorite bookstore. Look to the focus pages of California, Nevada, Utah, and Nebraska for route guides of the highways that today follow the route of the Lincoln Highway, including Interstate 80, U.S. 30, U.S. 40, and U.S. 50. 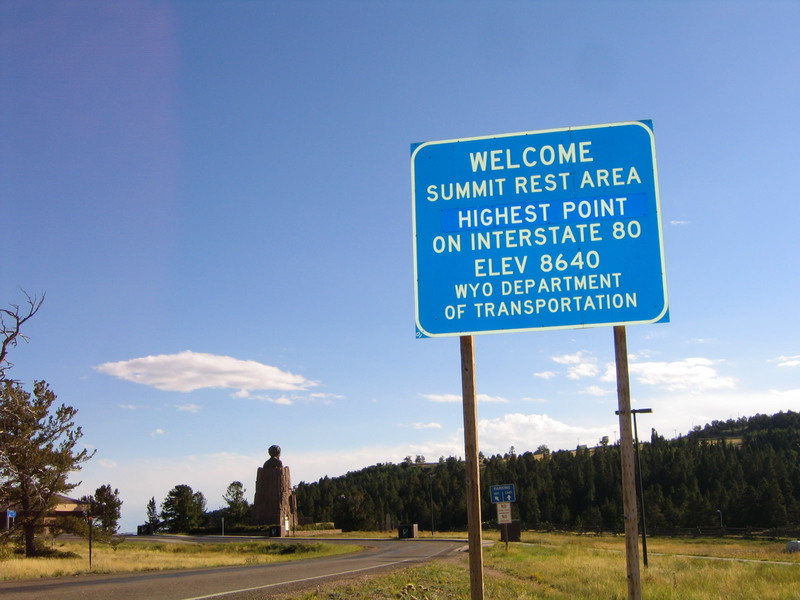 The Summit Rest Area, located at Exit 323 (Wyoming 210/Happy Jack Road) is a place steeped in historical, geographical, and scenic interest. 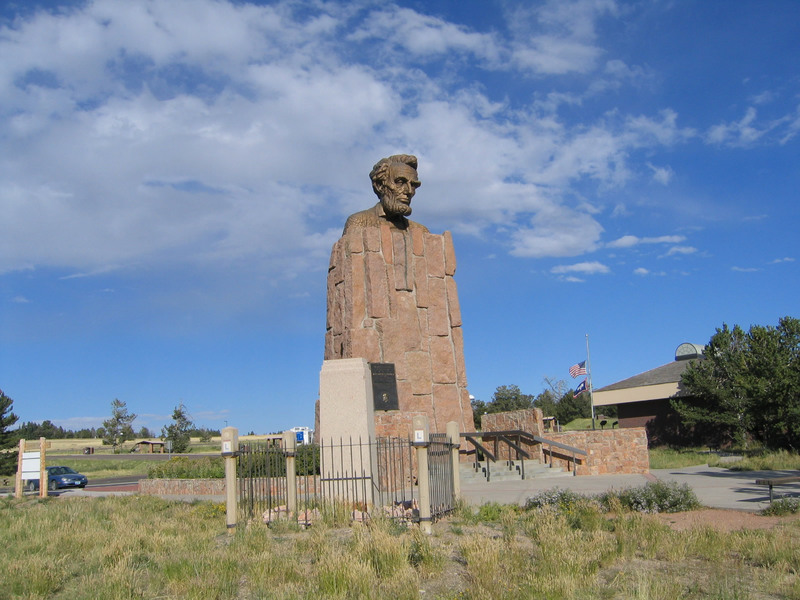 Located at the highest point of transcontinental routes Interstate 80, U.S. 30, and the Lincoln Highway at 8,640 feet above sea level, the rest area features a bronze bust of President Abraham Lincoln to commemmorate the highest point on the well-known Father Road. The Department of Transportation saw fit to place this sign indicating the elevation of the Sherman Hill Summit at the entrance to the rest area and tourist information center. Photos taken 08/02/10 and 09/06/05. 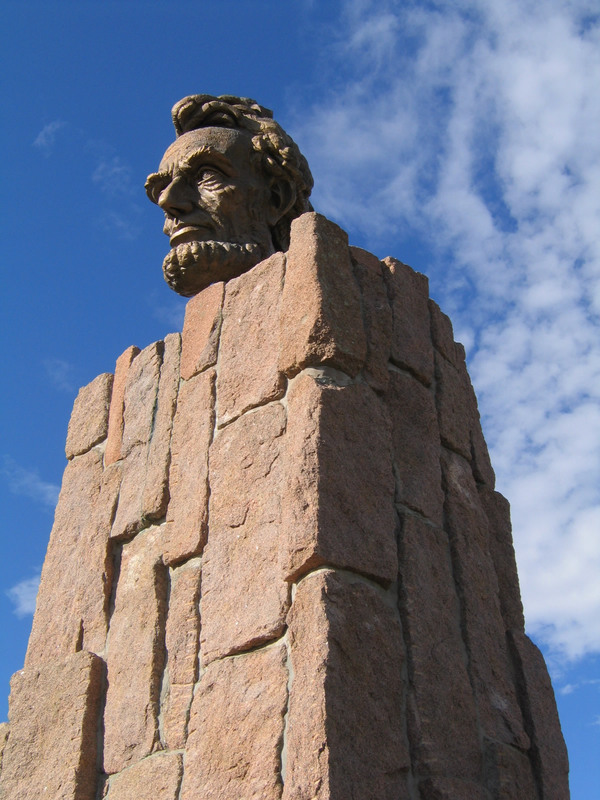 Aside from the exhibits found within the visitors center of the Summit Rest Area are several other Lincoln Highway artifacts and memorials on the grounds near the parking lot. The Lincoln Highway, which predates both Interstate 80 and U.S. 30 but came after the railroad, was established by Carl Fisher in 1913 to define a transcontinental route that would connect New York City with San Francisco. The goal was to have the road ready for the 1915 Panama-Pacific International Exposition in San Francisco, and most of the road was mapped by that time. However, the Lincoln Highway was barely passable for all of its original 3,389 miles, especially in western states where it passed through unpopulated areas. The road was gradually improved, and even President Eisenhower passed over portions of the Lincoln Highway as part of a miliary convoy, causing him to become interested in good roads. The Lincoln Highway eventually became part of the U.S. Highway System, and the majority became U.S. 30 from Utah to Pennsylvania. This sign, which is posted adjacent to the Henry Bourne Joy Monument, offers an historical overview of the route. Photo taken 08/02/10. 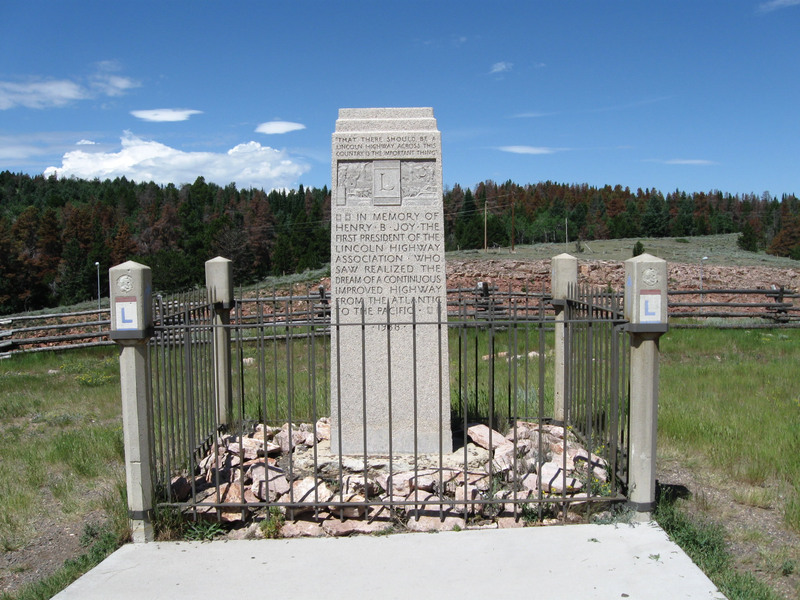 Henry Bourne Joy was the first president of the aforementioned Lincoln Highway Association (LHA), and his wish was to be buried in the Great Divide Basin in south-central Wyoming. Joy witnessed a sunset that he described as the most beautiful he had ever seen when he drove the Lincoln Highway in 1916, hence his desire. 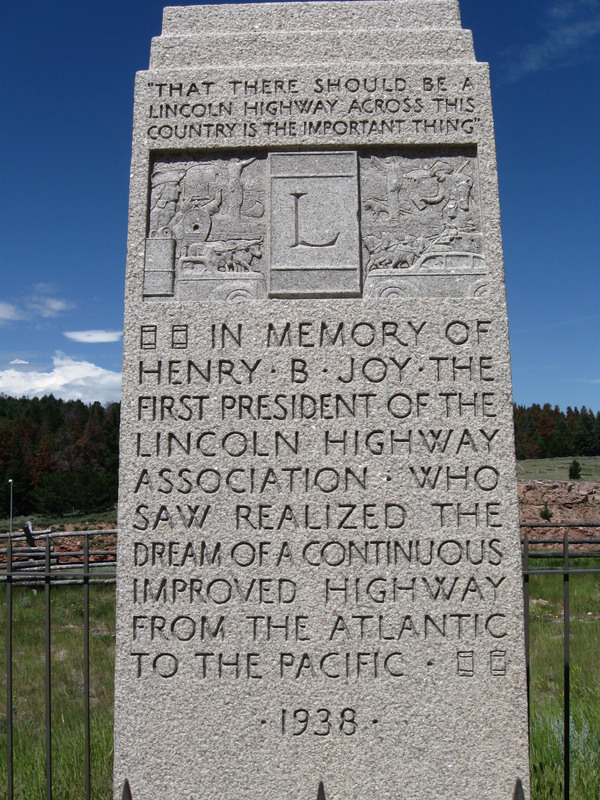 While he never was buried at the site, a monument was placed in the basin at Continental Divide Road (now Exit 184) in 1936 to memorialize Mr. Joy and the history of the transcontinental Lincoln Highway. 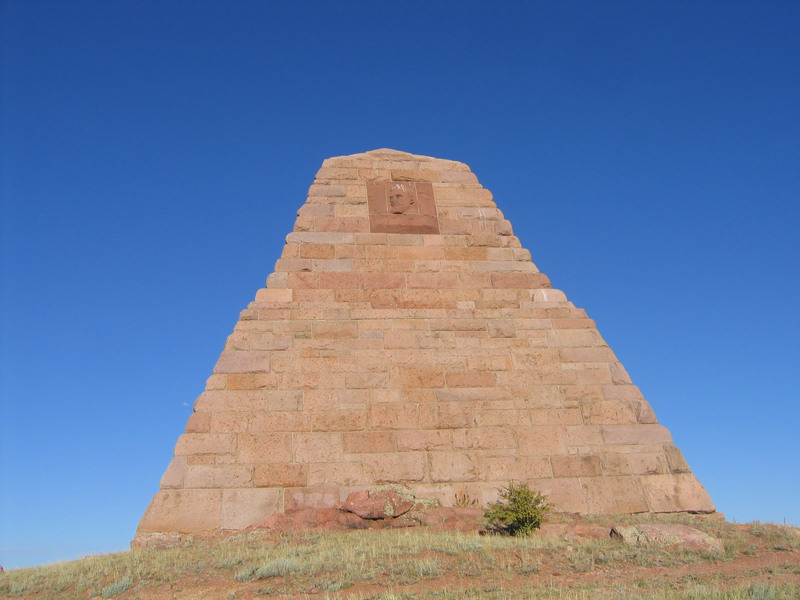 The Joy memorial was moved in 2001 from the Great Divide Basin site due to extensive vandalism and damages made to the monument area. Now the Joy monument is found next to the Abraham Lincoln memorial at the Summit Rest Area. Photos taken 09/06/05 and 08/02/10. Replica Lincoln Highway markers surround the Henry Bourne Joy monument. At the nearby tourist information center, information is only available from a clerk during the summer months, but the exhibits and restrooms are open year-round. The exhibits include a historical journey of the Lincoln Highway and routing of the road up Telephone Canyon to the Summit. Wildlife information, a large regional wall map, and other exhibits are also presented inside the rest area/visitors center. A spectacular view of the surrounding Pole Mountain wilderness areas along with the Vedauwoo rocks is afforded from a deck on the back of the visitors center. 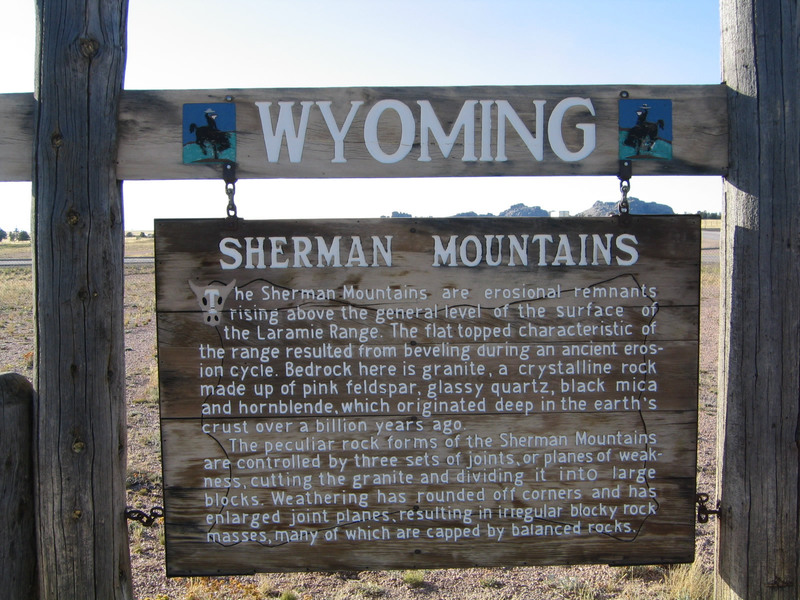 To reach Pole Mountain, use Wyoming 210 east; to Vedauwoo, continue east on Interstate 80 and U.S. 30 to Exit 329. Photos taken 08/02/10. 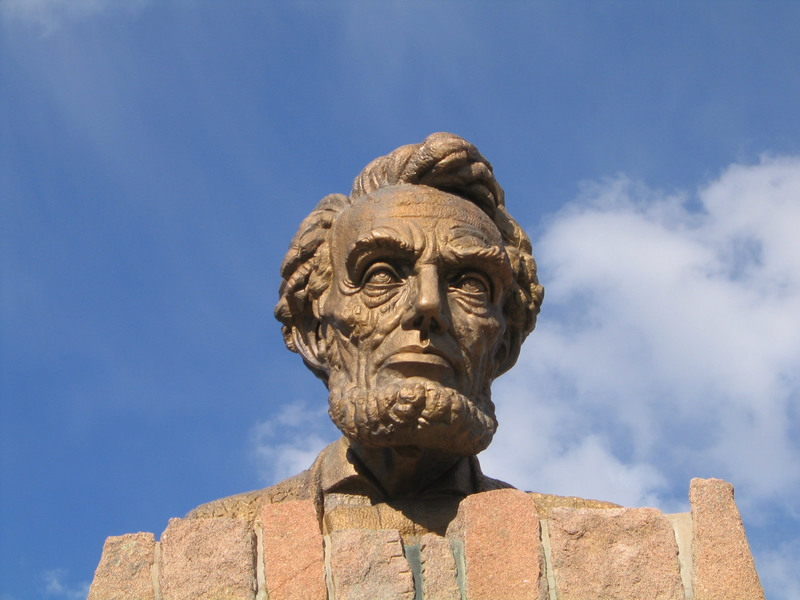 The bronze bust of Abraham Lincoln was first installed at the highest point on the Lincoln Highway in 1959, which is located on the service road between Exits 323 and 329. 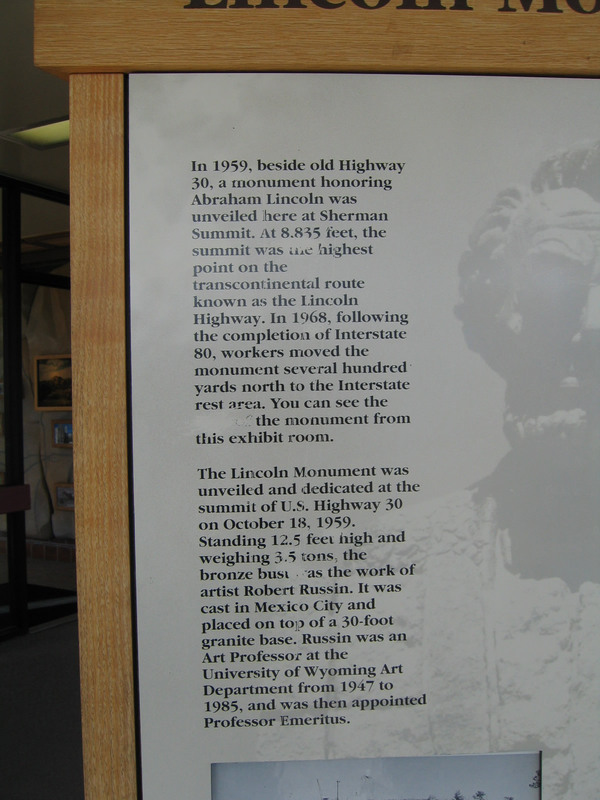 The service road on the south side of the freeway follows the original route of U.S. 30/Lincoln Highway, and the bust was placed at the summit of the service road at an elevation of 8,835 feet. The old highway became the service road when the freeway was opened in 1969. 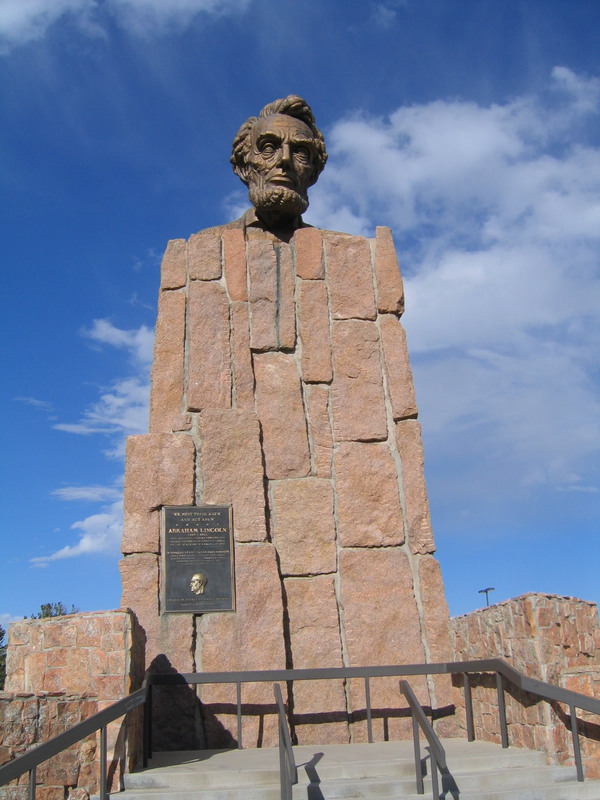 At the same time, the bust of President Lincoln was moved to its present location, at the Summit Rest Area at an elevation of 8,640 feet. Photos taken 09/06/05. 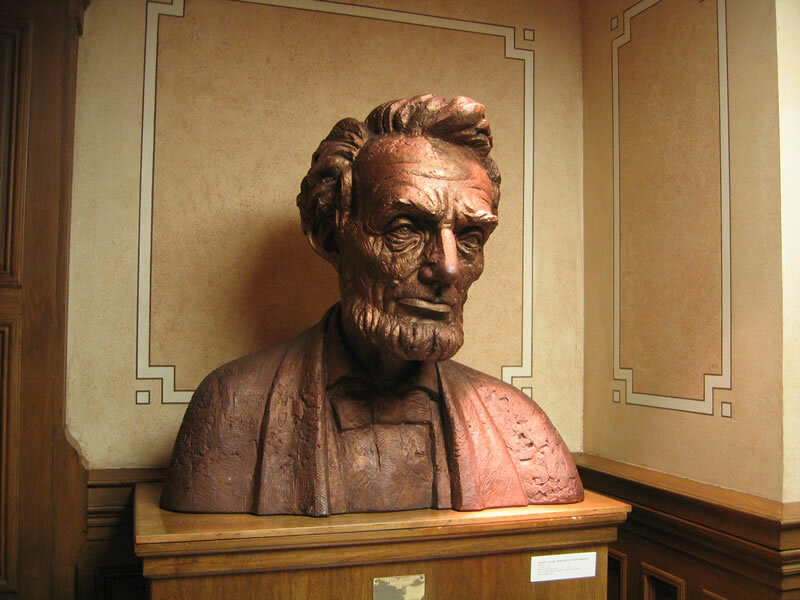 Robert Russin, who was an art professor at the University of Wyoming, designed and created the 13.5-foot tall bronze bust of Lincoln in 1959 to celebrate the president's 150th birthday. According to Greetings from the Lincoln Highway by Brian Butko (2005, pg. 189), Russin used ten tons of clay to create the bust, and the bust was cast in 30 pieces in Mexico City (which has a more favorable climate for such construction than Wyoming). 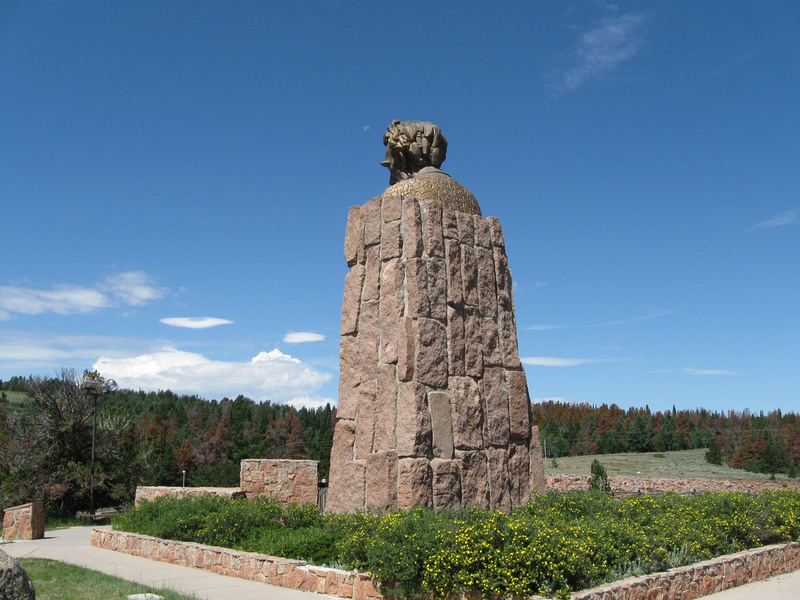 The bust was transported from Mexico to Wyoming and placed atop a 35-foot tall base made of granite. The granite base is hollow, allowing for ladders and lightning rods inside. Of course, the memorial only lasted ten years in its original location at the 8,835-foot summit; it was moved in 1969 to its current location at the 8,640-foot summit. Photos taken 09/06/05. 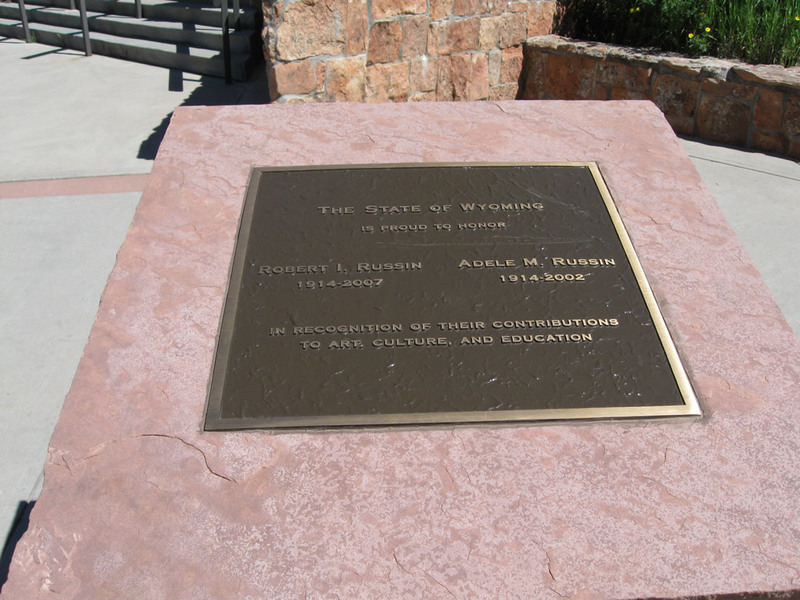 A small bronze plaque is placed at the base of the pedestal and bust, and it indicates that the memorial was provided for by the state of Wyoming. Photos taken 09/06/05. Inside the summit rest area adjacent to the Lincoln Monument are some interpretive panels describing the construction of the monument and importance of Sherman Hill on the transcontinental Lincoln Highway. Photos taken 09/06/05. Here, President Lincoln looks down on his highway and the thousands who pass by daily at Sherman Summit. Photos taken 08/02/10. A model of the bust created by Russin is now housed in the State Capitol in Cheyenne. Similarities between the model and the actual memorial bust are evident. Photo taken 09/06/05. 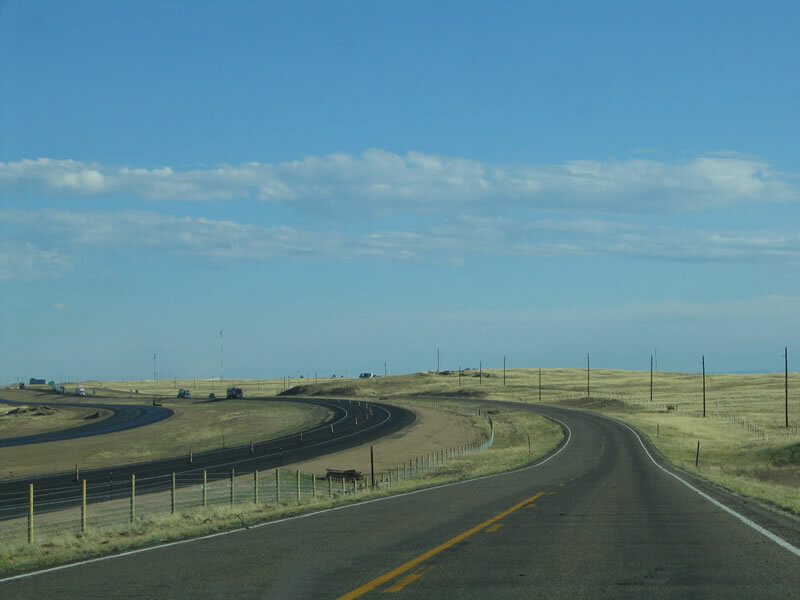 An extant section of old U.S. 30 still serves as a service road along the south side of Interstate 80 between the Wyoming 210/Happy Jack Road interchange (Exit 323) and Vedauwoo Road interchange (Exit 329). The former U.S. route follows the second generation (1930s era) of Lincoln Highway over the top of Sherman Hill, ascending to an elevation (8,835 feet) higher than that of the Interstate 80 Summit Rest Area (8,640 feet), which is regarded today as the highest point on Interstate 80, U.S. 30, and the Lincoln Highway. Photo taken 09/06/05. 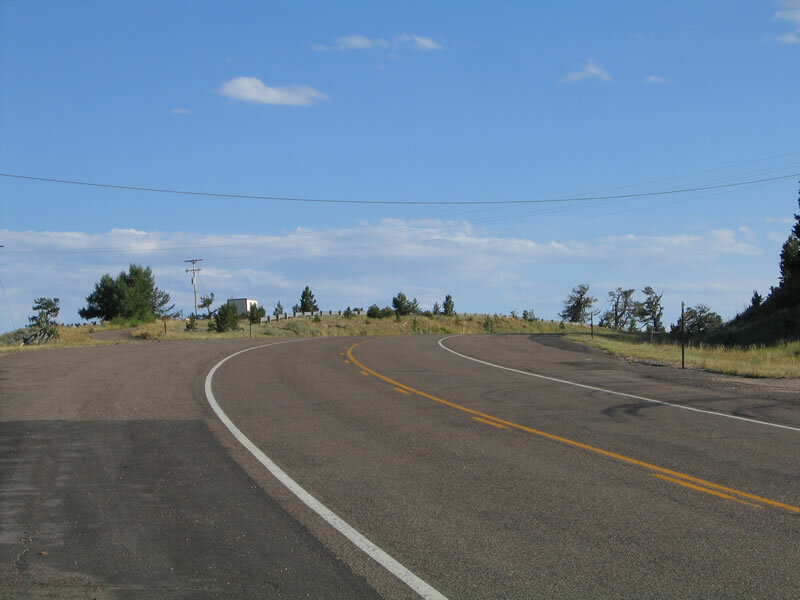 On this two-lane highway, the old Lincoln Highway carries a 65 mile per hour speed limit, even as the highway continues to gain elevation to the top of Sherman Hill. There is a total of 195 feet in elevation that separate the two summits of Interstate 80/U.S. 30 and Old U.S. 30. This service road is the 1930s alignment of the Lincoln Highway, but it is not the original route over Sherman Hill. Another alignment from the 1920s also crosses the summit, but it is now a gravel road. 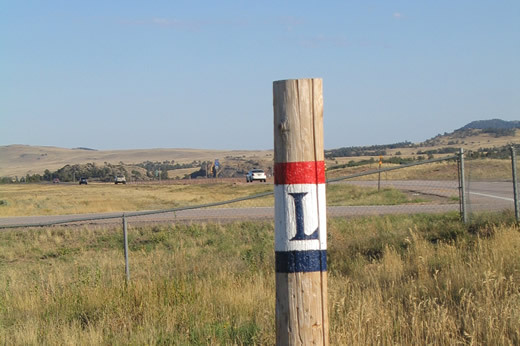 Consult a good Lincoln Highway guidebook to locate this alignment as well as the Harriman Road alignment via Wyoming 218 southwest to U.S. 287 at Tie Siding. Photo taken 09/06/05. 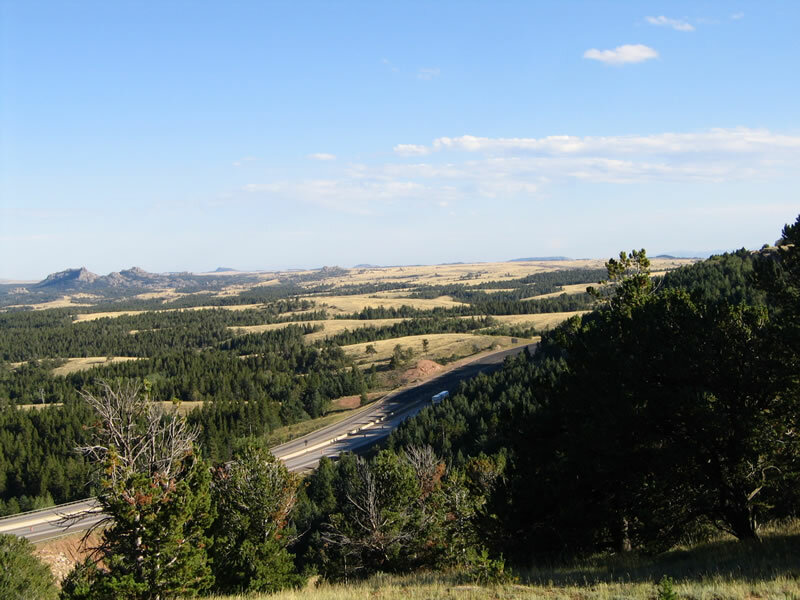 A wide spot in the road, with a turnout on the north side of the Old Lincoln Highway, offers a view of the surrounding area, including Pole Mountain to the north and Vedauwoo to the northeast. This turnout also marks the highest point on the transcontinental Lincoln Highway. Photo taken 09/06/05. 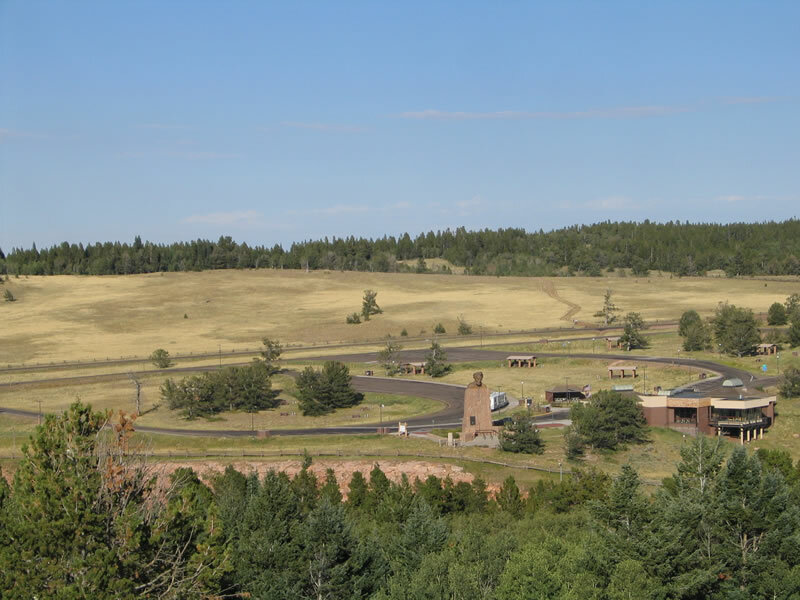 The entire Summit Rest Area is visible from the turnout on top of Lincoln Highway. 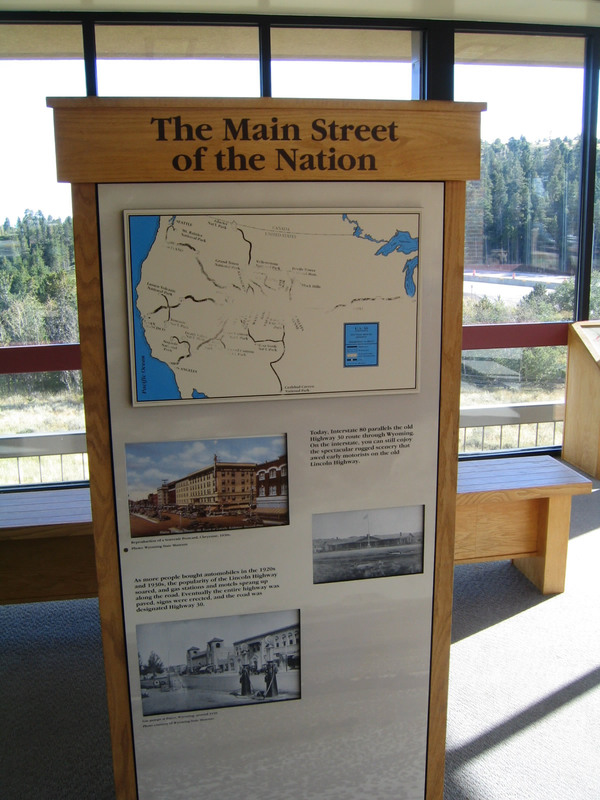 Several historical exhibits about the Lincoln Highway as well as tourist information is available at rest area. Photo taken 09/06/05. Finally reaching the top of Sherman Hill, the Lincoln Highway briefly flattens out. A spectacular view of Vedauwoo and Pole Mountain is available to the north of the old road. Photo taken 09/06/05. 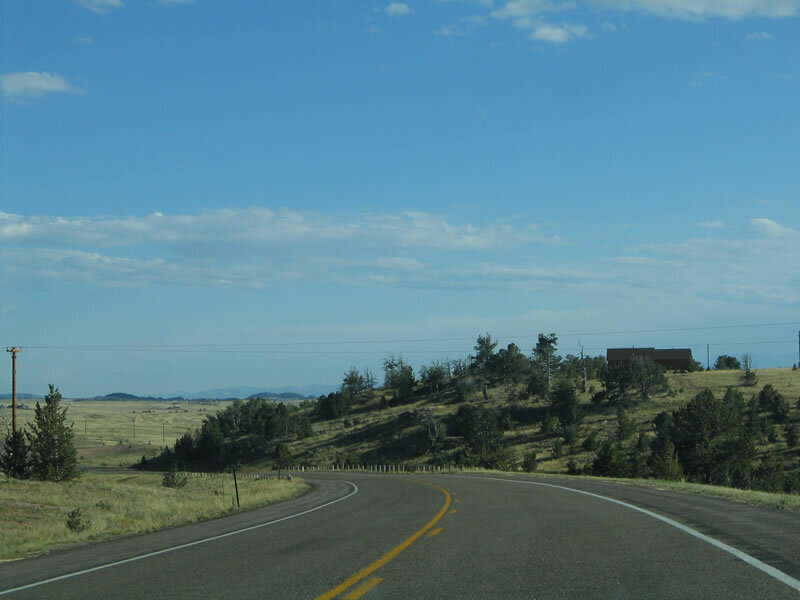 This is an example of the scenery to the north and northeast of the Lincoln Highway. The Vedauwoo Rocks, which are famous with rock climbers throughout the West, dominate the northern view, while the great plains spread out to the east. Only a surprisingly few trees reside in the valleys, basins, and canyons of Sherman Hill; the rest of the land is devoid of tall vegetation. 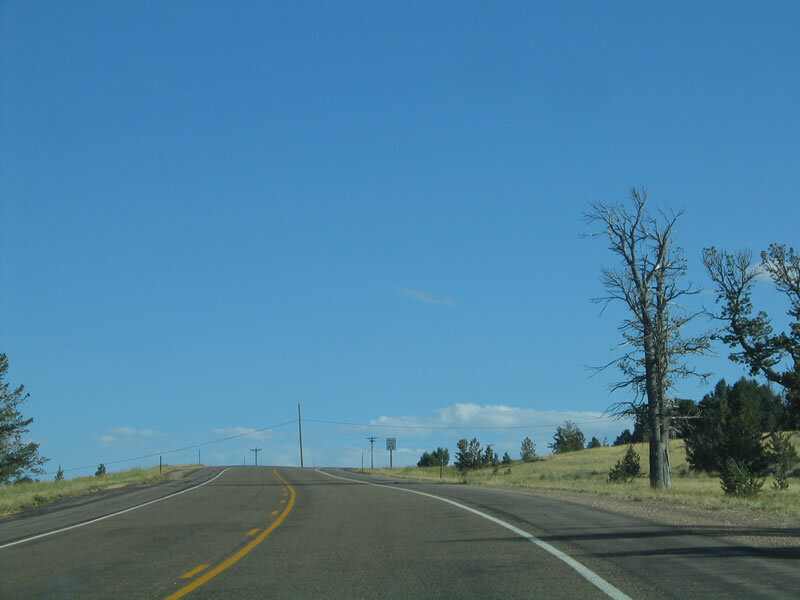 Wyoming winds blow through the area routinely, and this constant flow of air does not promote tree growth. Photo taken 09/06/05. Lincoln Highway (Old U.S. 30) begins to descend from Sherman Hill. A single house rests on the hill in the distance. Photo taken 09/06/05. The old road runs side by side with the newer Interstate 80. U.S. 30 was routed on this section of Lincoln Highway until the freeway section between the Summit Rest Area and Blair Road (near Vedauwoo Road) opened in October 1966. At that time, the U.S. highway was rerouted onto the new freeway. Photo taken 09/06/05. At the time this photo was taken, a fresh layer of asphalt had recently been applied on Interstate 80 and U.S. 30. This made the distinction between old and new much clearer. Photo taken 09/06/05. 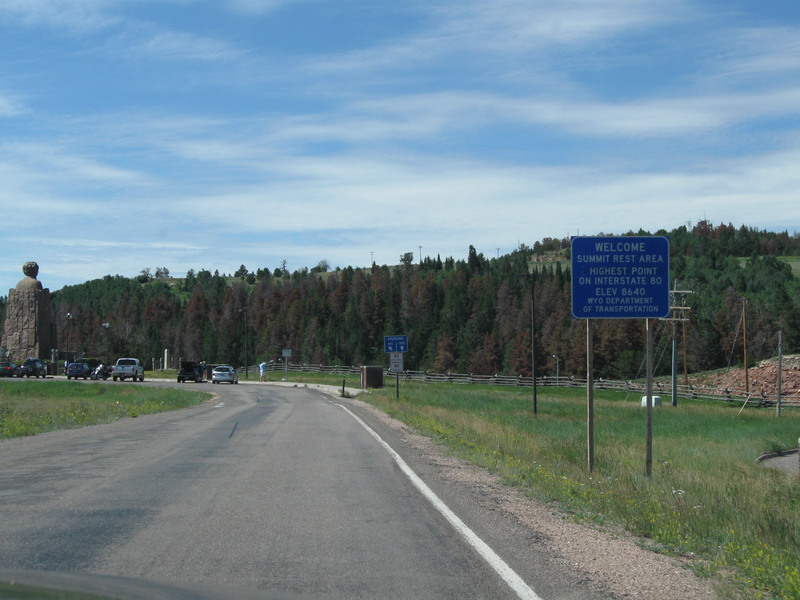 The advance signage for Exit 329, Vedauwoo Road (Forest Service Road 700) is visible from the Lincoln Highway service road. Photo taken 09/06/05. 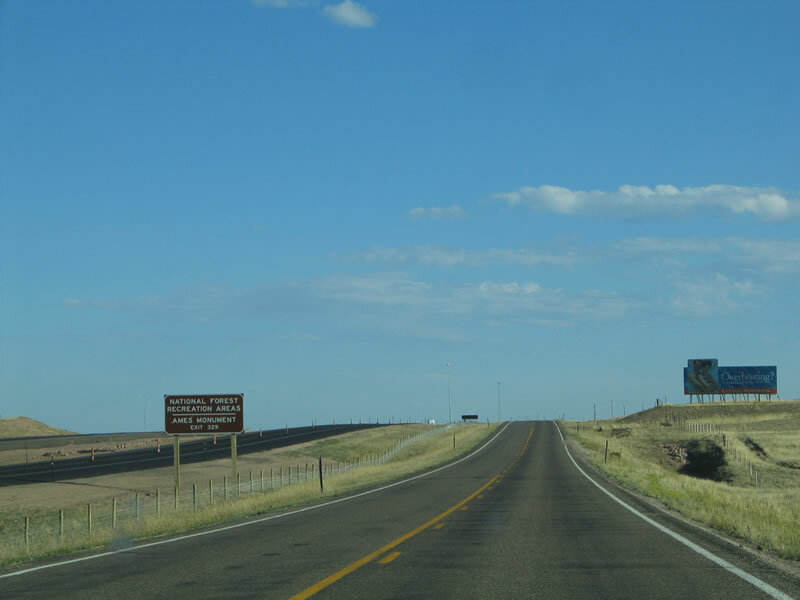 A brown guide sign indicates that several attractions, including the Medicine Bow National Forest Recreation Areas in Vedauwoo that are north of Interstate 80 and the Ames Monument south of Interstate 80 are both accessible via Exit 329. Just prior to reaching Vedauwoo Road, old U.S. 30 meets Blair Road. Photo taken 09/06/05. Eastbound Old U.S. 30/Lincoln Highway reaches the junction with Vedauwoo Road. 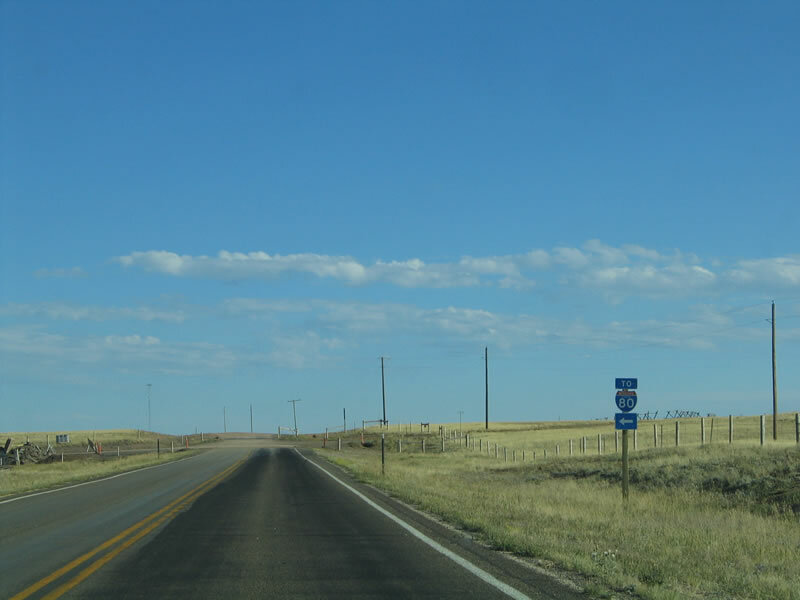 The old highway still exists in sporadic segments between here and Otto Road (Wyoming 225), but significant portions were overlaid by Interstate 80 or are no longer in use. Turn right onto the gravel road to follow the 1913 alignment of the Lincoln Highway toward Ames Monument. Photo taken 09/06/05. Southeast of the Vedauwoo Road interchange, follow the gravel road toward Ames Monument. Near Ames Monument, the gravel road connects to the 1913 Lincoln Highway near the site of the town of Sherman (now gone). 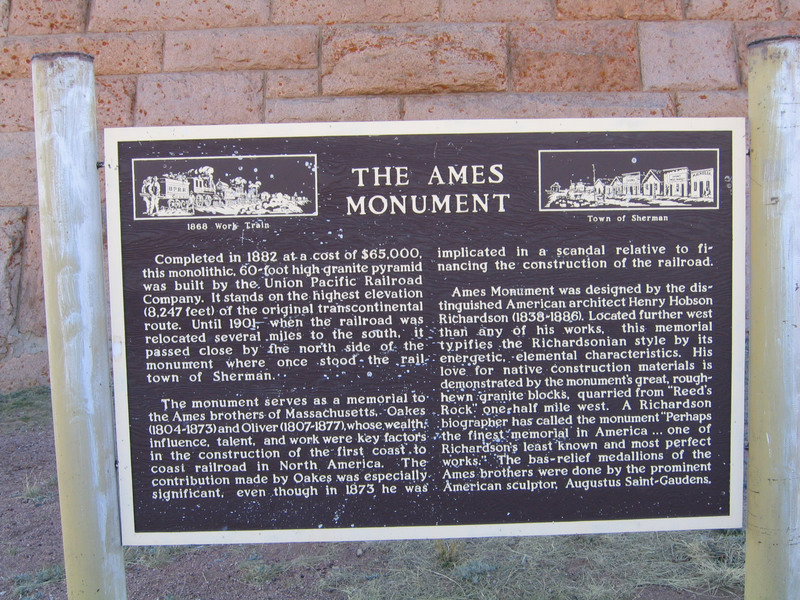 The Ames Monument is a hollow, pink granite pyramid that marks the former highest point on the 1880s alignment of the Union Pacific Railroad (8,247 feet above sea level). It was designed by Henry Hobson Richardson, a noted architect of that era. Today, the railroad follows a different alignment over Sherman Hill that affords a gentler slope a bit to the south. The railroad and Interstate 80 separate at the Buford interchange (Exit 335) and do not reunite until the Union Pacific Railroad Viaduct (U.S. 287) in Laramie. To follow the old Lincoln Highway to Tie Siding, continue southwest past Ames Monument. Consult a detailed map of the area to determine the old Lincoln Highway between Buford and Tie Siding. Photo taken 09/06/05. 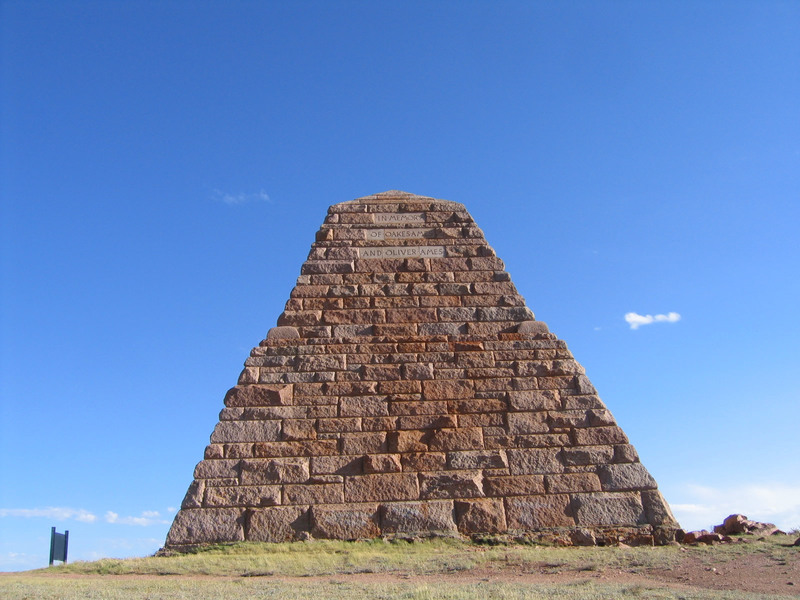 These photos show three of the four sides of the pyramid, which rises 60 feet above the high plains. Constructed in 1882, the monument was named for U.S. Congressman Oakes Ames and his brother Oliver Ames, who was the third president of the Union Pacific Railroad. According to Greetings from the Lincoln Highway by Brian Butko (2005, pg. 187-8), this monument was intended as a monument for passing trains, but the railroad was realigned away from it in 1901. The Lincoln Highway originally passed by the monument, but it was rerouted away from it in 1920s and 1930s; today's version of the Lincoln Highway (Interstate 80) stays a couple miles north of here. 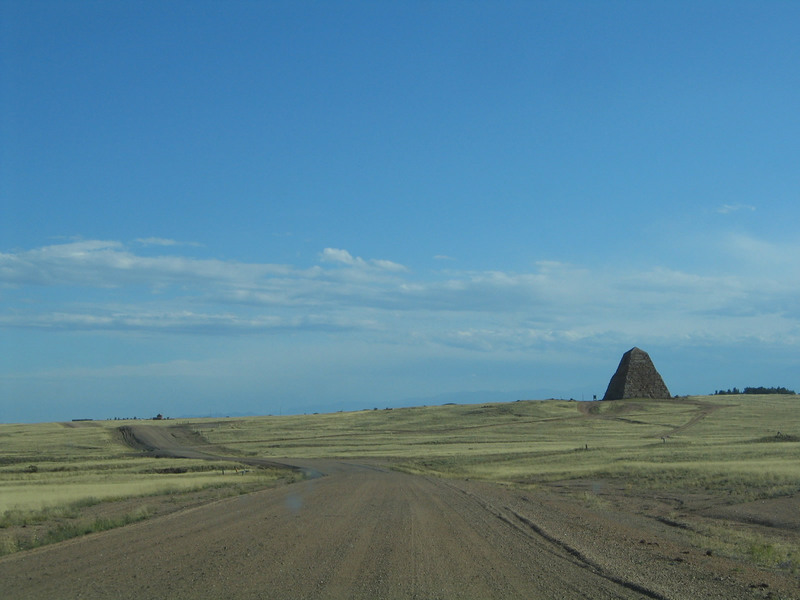 As a result, the pyramid sits alone surrounded by sagebrush and dirt roads. Photo taken 09/06/05. 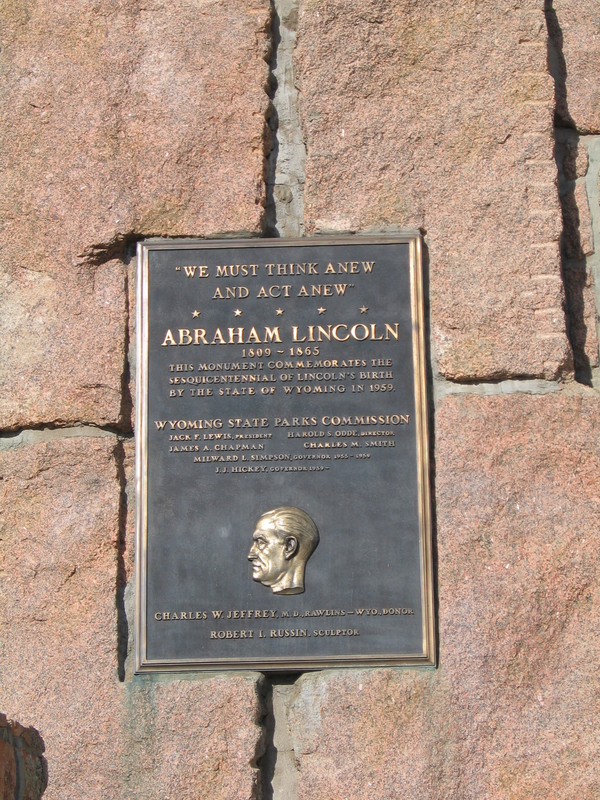 According to this plaque and Greetings from the Lincoln Highway by Brian Butko (2005, pg. 187-8), both brothers were financiers of the railroad line; they were from Massachusetts. The brothers not only financed the transcontinental railroad, but they also used their connections to help construct it. A scandal followed, with allegations of corruption and bribery. Oakes Ames, the congressman, was found guilty of bribery related to the financing of the railroad construction. 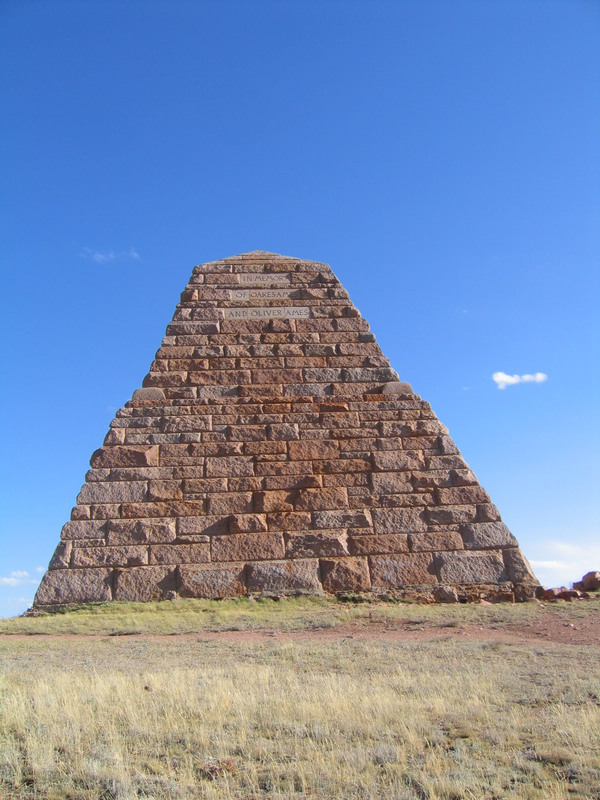 The pink granite used to construct this pyramid was brought in from a nearby quarry. Photo taken 09/06/05. Located at a left exit along Interstate 80/U.S. 30 near Milepost 333 (between the Buford interchange and the Vedauwoo Road/Ames Monument interchange) is the "Tree Rock." A limber pine tree grows here from a crack in the large granite boulder. One of the legends of the railroad construction was that the railroad was aligned specifically to pass by the Tree Rock, so that railroad engineers could throw buckets of water onto the tree to facilitate its growth. The railroad passed Tree Rock between 1869 and 1901; it was realigned away from the tree. 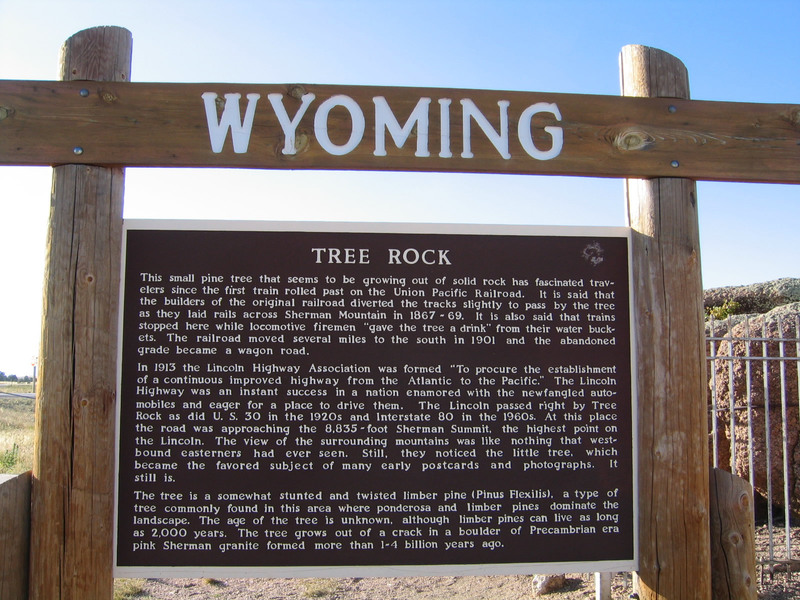 The age of the tree and rock could date many years; the rock is from the Precambrian Era and might be over a billion years old. 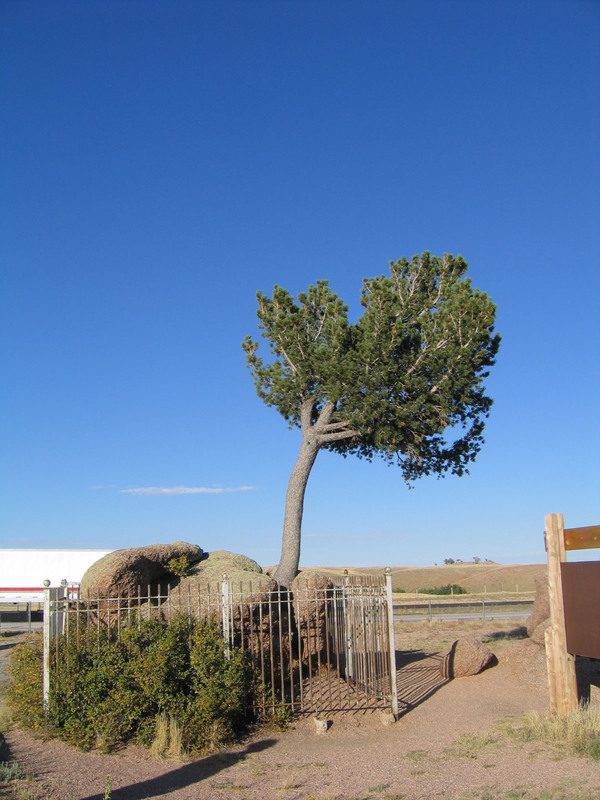 The limber pine can be up to 2,000 years old, although this specimen is probably younger. Photo taken 09/06/05. A large sign that details not only the history of Tree Rock but also the story of the Lincoln Highway is posted at the Tree Rock parking area near Milepost 333. Photo taken 09/06/05. Near the Tree Rock is another sign welcoming travelers to the Sherman Mountains, which includes Sherman Hill and the Interstate 80 Summit. These mountains feature the irregular rocks and boulders such as those found at Vedauwoo, and the sign attempts to explain the the geological forces that have cut the bedrock granite. Over time, the granite was divided into large blocks that in turn were weathered through wind and precipitation through the ages. As a result, rocks such as those found at Vedauwoo and Pole Mountain are abundant in the Sherman Hill area. Photo taken 09/06/05. 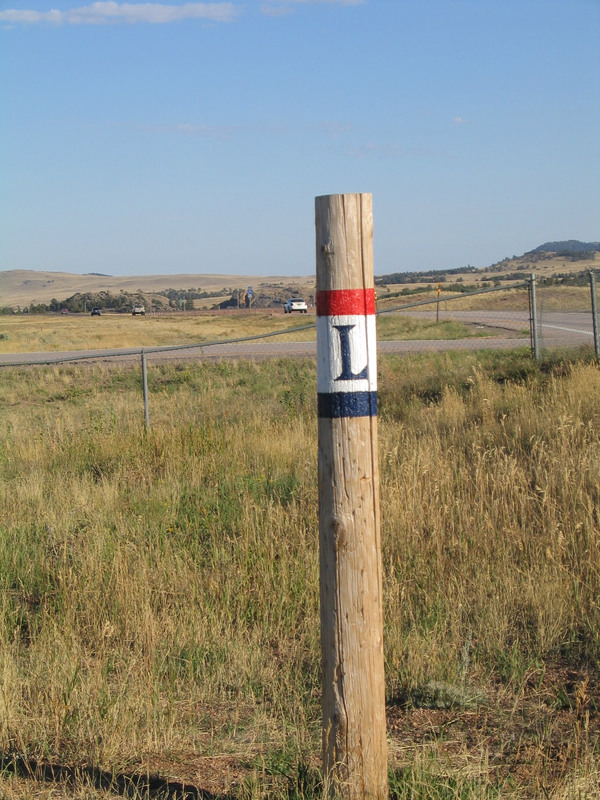 A replica Lincoln Highway trailblazer is painted onto a wooden pole at the Tree in Rock parking area. Photo taken 09/06/05. 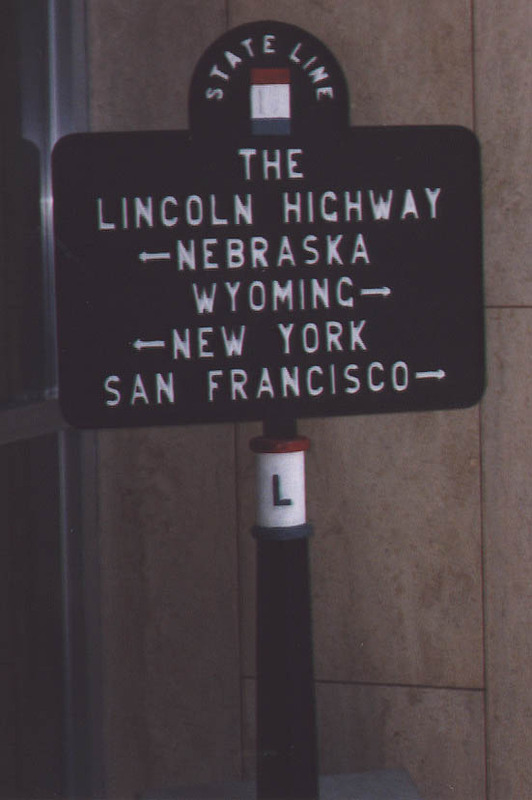 At each state line along the Lincoln Highway were markers such as this one that provided the highway emblem at the top, the name "Lincoln Highway" at the middle, the two states immediately below the name, and the two endpoints of the highway (New York City to the east and San Francisco to the west). These signs were found at each state line as far back as 1917. 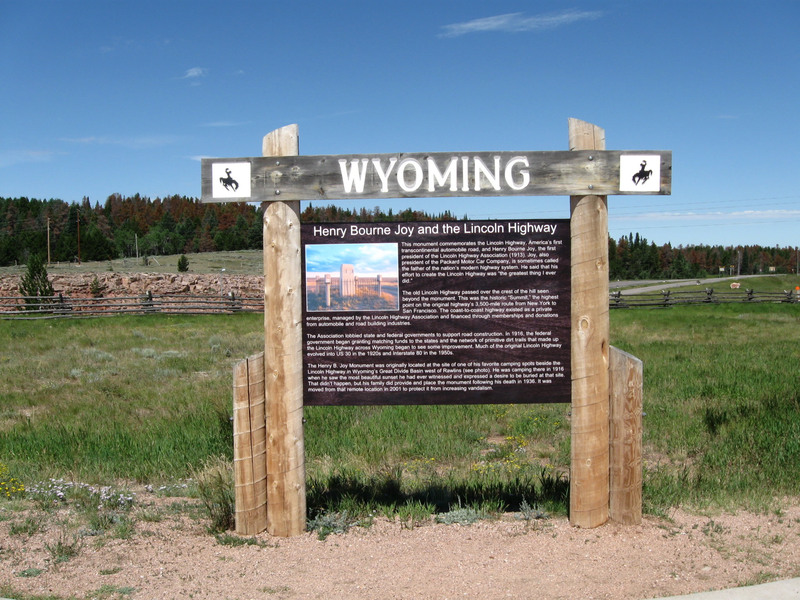 Today, the marker that used to be located at Pine Bluffs is now found in the Wyoming Department of Transportation Headquarters in Cheyenne; this photo shows that signage from an earlier era of vehicular transportation in Wyoming. Photo taken 08/22/98. Page Updated September 15, 2014.